UDOT admitted to double dipping accounting to justify the cost of the noise wall. The Governor’s office said there was nothing they could do about it. There are two UDOT Noise Abatement Criteria (NAC) land use categories at Jeremy Ranch. One is NAC land use Category B which is residential and the other is NAC land use Category C which is recreational. See Diagram 1 below. Each land use Category has its own distinct and separate cost criteria. There is no mixed land use Category. There are no mixed or blended cost criteria. There are two different walls being proposed at Jeremy Ranch, and each must be evaluated separately. The maximum allowable cost for a wall intended to protect a recreational area is $360 per lineal foot. The maximum allowable cost for a wall intended to protect a residential area is $30,000 per benefited receptor. A benefited receptor is a noise sensitive receptor that receives a noise reduction of at least 5dBA. The number of benefited receptors will be used in determining if the noise abatement measure has a reasonable cost. A reasonable cost is considered to be a maximum of $30,000 per benefited receptor for activity Category B.
UDOT proposed to build an 18 foot high wall with a length of 3200 feet at Jeremy Ranch. UDOT claims the wall would protect 24 benefited receptors. See Diagram 2 below. UDOT without a written standard practice for identifying land use categories, as required by 23 CFR 772, arbitrarily approximated or guessed that half of the proposed wall or 1600 feet was intended to protect the recreational area and half or 1600 feet of the proposed wall was intended to protect the residential area. See Diagram 3 below, where the benefited receptors are shown in orange, the wall intended to protect the residential area is shown in orange and the wall intended to protect the recreational area is shown in yellow. Calculating the cost of each wall, starting with the cost of the wall intended to protect the recreational area which is shown below in Diagram 4 as shown in yellow. The wall intended to protect the recreational area according to UDOT is 1600 feet long. The maximum allowable for a wall intended to protect a recreational area is merely determined by its length. The cost of the Jeremy Ranch 18 foot high recreational wall is $360 per lineal foot plus $35 per lineal foot for guardrail protection. The cost per foot is $395 which exceeds the maximum allowable cost of $360 per foot. No length of an 18 foot high wall, with items critical to safety, intended to protect a recreational area meets the cost reasonableness criteria. Next is the cost calculation of the wall intended to protect the residential area. See Diagram 5 below which shows UDOT’s 1600 foot wall intended to protect the residential area and the benefited receptors UDOT claims shown in orange. UDOT counts the benefited receptors that are not behind or protected by the wall to falsely claim they meet the cost criteria. UDOT’s faulty calculation begins with the arbitrary decision that the length of the wall intended to protect the residential area is 1600 feet. This faulty calculation leads to a false result of the residential portion of the wall only costing $24,000 per benefited receptor. When the calculation is done correctly, according to the requirements of the UDOT Noise Policy, the maximum allowable cost for a wall intended to protect a residential area is determined by the length of the wall and the number of benefited receptors protected by it. The length and number of benefited receptors are both used to determine if the cost is reasonable. Since the original Lochner report identified, in Table 4 and in Appendix D, the number and location of receptors under the heading of NAC Land Use Category B, it would seem logical that the length of the wall intended to protect NAC Land Use Category B would span the distance necessary to provide protection to those receptors. The most logical case would be the one shown below as Option 1. One would also assume that this would be supported by the written standard practice for identifying land use activity categories. But it appears that, in spite of being required by federal regulation, UDOT does not have a written standard practice. 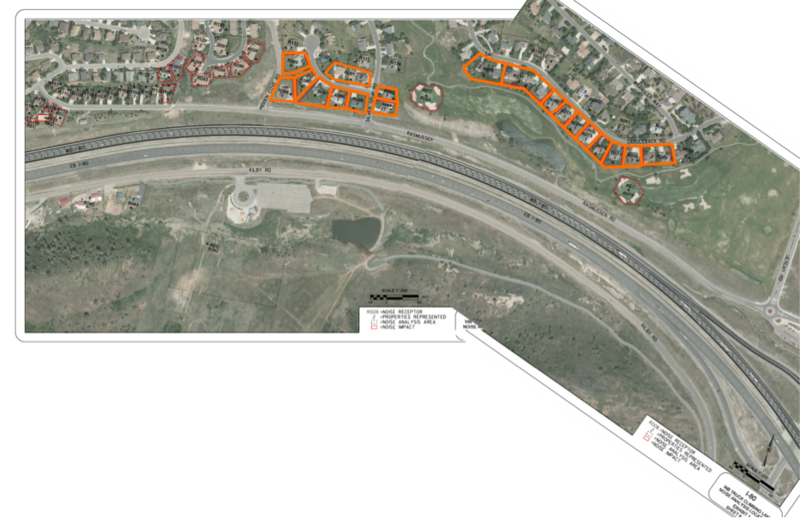 UDOT, Lochner and Horrocks instead have relied on an arbitrary decision, an approximation, a mere estimate as to how long the wall intended to protect the residential area is. By doing so they are understating the length of the wall intended to protect the residential area and overstating the number of benefited receptors protected by it. UDOT is taking credit for benefited receptors that are not even physically behind the residential portion of the wall, as shown in Diagram 5 above. Using the actual length of the wall intended to protect the residential area and the actual number of residential benefited receptors clearly makes the wall not cost reasonable. The actual cost of the residential portion of the wall is $20 per square foot x 18 feet x 2560 feet plus $35 per foot x 2560 feet which equals $1,011,200. The maximum allowable is $30,000 per benefited receptor. The cost per benefited receptor is $1,011,200 divided by 24 equals $42,133 which exceeds the maximum allowable. The actual cost of the length of wall intended to protect the recreational area is $360 per lineal foot x 640 feet plus $35 per foot x 640 feet which equals $252,800. The maximum allowable cost is $360 x 640 feet which equals $230,400. The actual cost of $252,800 exceeds the maximum allowable of $230,400. The actual cost of the residential portion of the wall is $20 per square foot x 18 feet x 1600 feet plus $35 per foot x 1600 feet which equals $632,000. The maximum allowable is $30,000 per benefited receptor. The cost per benefited receptor is $632,000 divided by 15 equals $42,133 which exceeds the maximum allowable. The actual cost of the wall intended to protect the recreational area is $360 per lineal foot x 1600 feet plus $35 per foot x 1600 feet which equals $632,000. The maximum allowable is $360 per lineal foot x 1600 feet equals $576,000. The actual cost of $632,000 exceeds the maximum allowable of $576,000. The actual cost of the residential portion of the wall is $20 per square foot x 840 feet x 18 feet plus $35 per foot x 840 feet equals $331,800. The maximum allowable is $30,000 per benefited receptor. The cost per benefited receptor is $331,800 divided by 10 equals $33,180, which exceeds the maximum allowable. The actual cost of the wall intended to protect the recreational area is $360 per lineal foot x 2360 feet plus $35 per foot x 2360 feet which equals $932,200. The maximum allowable is $360 per lineal foot x 2360 feet equals $849,600. The actual cost of $932,200 exceeds the maximum allowable of $849,600. that meets the cost criteria.